Happy Thursday, friends! We’re almost through the first week in November and just can. not. wrap my head around the holidays coming up. And usually I live for holiday season. I just can’t get into this year for some reason. Hopefully I’ll snap out of it soon so I can start holiday baking and menu planning and all that jazz. You guys get into holiday planning ruts too, right?? When you’d rather walk into oncoming traffic than think about the holiday menu. Or shopping. Ugh. No? Well, that’s good. Don’t walk into traffic. That would be terrible. 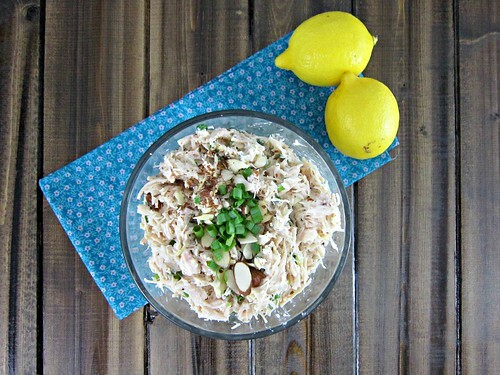 But if you do need a break, and you need something that is easy to prepare, that won’t take much brainpower, then this chicken salad is exactly what you need. Because it’s like, the best thing ever. I’ve been making this for several months now, the first time when we went hiking at a nearby park and needed something easy for a snack/lunch. I was in love from first bite. Now I make it most often when I need a quick and easy lunch. Using canned chicken can make it even faster if you are really in a hurry. Just sayin’. I don’t think J loves it quite as much as I do, but that’s most things lemon. Shrug. I love it, what can I say?? And the lemon isn’t overwhelming, either. It’s there, you can taste it, but you also get the crunch of the almonds, the green onions and parsley, and the creaminess of the yogurt and mayo. Well, and the chicken of course. Duh. And while I am perfectly content to devour it with a fork, I also quite enjoy scooping it out of the bowl with sweet ‘n’ spicy wheat thins. Yep, yep. Whatever vehicle you choose to shovel this into your mouth, just make sure you do. And then you can be in love and all addicted and stuff like I am. We can create a group. To eat this stuff all day, errry day. Heat a large skillet over medium-high heat and add the olive oil. Season chicken with the lemon pepper and salt and place in the skillet. Cook for 3-5 minutes per side, or until cooked through. Remove and place in a large bowl (or bowl of your stand mixer) and let the chicken rest for 10 minutes. Now use two forks, or the paddle attachment on your mixer, to shred the chicken. In a large bowl (perhaps the one you just shredded in?!?! 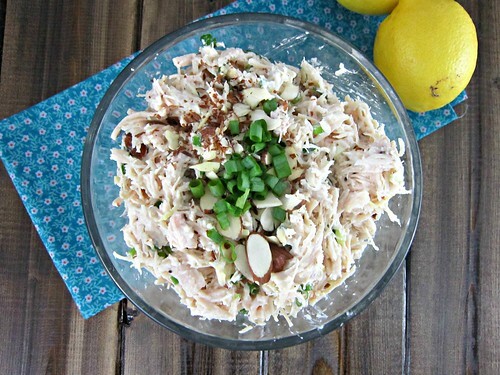 ), combine the chicken, almonds, lemon zest and juice, green onions, and parsley. Stir until well-combined, then add the yogurt and mayo and stir again! Season with additional salt and pepper, if desired. 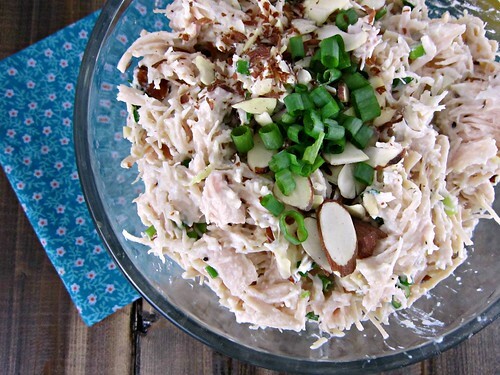 Top with almonds and green onions, if desired. Then serve with your favorite crackers, lettuce wraps, or whatever! We like ours with Buffalo or Sweet ‘n’ Spicy Wheat Thins. YUM!! Mm! I remember you telling me about this chicken salad. It is moving straight up to the top of my “to-make:lunches” list! Thanks for sharing!